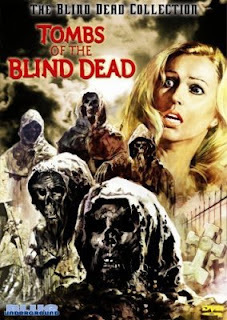 After directing several non-descript westerns and bizarre vampire flick Malenka (1969), Spanish filmmaker Amando de Ossorio really made his mark on the landscape of horror cinema with his series of Blind Dead films, the first of which was Tombs of the Blind Dead. The film and its sequels (Return of the Evil Dead, The Ghost Galleon and Night of the Seagulls) revolve around the exploits and murderous rampages of a group of living-dead Templar Knights. 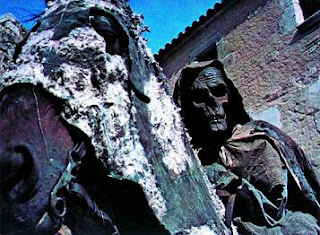 The Templars, medieval knights who were put to death for their wicked ways and satanic practices, rise from the dead as mummified skeletal beings, shrouded in their bloodied and soiled hooded garbs, to drink the blood of the living. As a result of having their eyes plucked from their hanging bodies by crows, they rely on sound to track their victims. Tombs of the Blind Dead has such a simple premise, and while the story is paper thin, the direction is handled so effectively by de Ossorio, who really shows his strengths when it comes to concocting an overwhelmingly creepy atmosphere dappled with inventive and utterly nightmarish visuals throughout. As this was the Seventies though, he does have a tendency of relying a little heavily on his zoom lens; which leads to more than a few unintentional laughs. Also hilarious is when Roger and Betty team up with a smuggler and his bitchy girlfriend they initially believed to be responsible for Virginia’s disappearance. The smuggler’s father, conveniently enough, is a highly regarded professor and expert on the Templar knights who is able to shed some highly expositionary light on the history of the fiendish creatures. Cue a flashback to the Templars in their heyday, sacrificing a young woman and drinking her blood. Cue also many close-ups of a large knife being plunged into latex breasts and bright red gore effects. When Roger, Betty, the smuggler and his girlfriend stay the night at the ruins in order to try and find out what happened to Virginia, there is a lot of wandering around through dusty, cob-webbed hallways, slowly opening doors and splitting up to investigate, well, completely inconsequential stuff. It’s just a lazy excuse to get the characters by themselves so they can be devoured by the creepy knights. Speaking of which, it is without a doubt the Templars who steal the show. 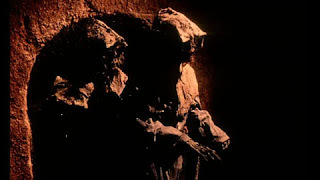 De Ossorio himself crafted the unique appearance of their horrid features - he designed the make-up effects that were utilised to create their ghastly visage. To his credit, they are indeed the stuff of childhood nightmares. The images of the rotting and fetid knights wearily rising, empty-orbed, from their graves are striking and supremely sinister. 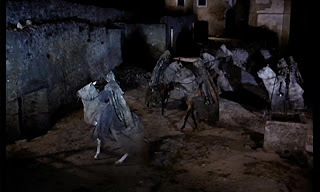 The knights also ride on the backs of spectral horses, and they do so in slow motion, which adds to the spooky and surreal atmosphere. Even the day-for-night photography, a staple of most low budget horror films from yesteryear, adds a touch of the uncanny to the film. The fact that these mummified and shambolic ghouls are decomposing doesn’t stop them from slowly but surely closing in on their prey. To begin with, the frantic, panic-stricken and hysterical actions of the victims as they desperately try to flee their attackers, contrasts nicely with the shuffling, yet unstoppable advancement of the Templars, and quite a bit of tension is created. However it soon becomes quite tiresome. There’s only so much care and concern you can invest in characters that seem to have problems with such basic tasks as simply opening a door, or, I don’t know, just stepping out of the way of the advancing, arms-outstretched living-blind-dead. Aside from the eerie appearances of the Templars, another memorable moment occurs right at the end of the film, just as the two remaining survivors board a packed train to seek rescue. The knights also board the train just as it moves off and wreck bloody havoc on-board. When the train plunges into the busy station the ghouls disembark to slaughter more innocents on the platform and we are left with the haunting image of the sole survivor of the carnage as she huddles helplessly in the coal bunker. Highly recommended for those who like their horror atmospheric, creepy and at times sporting that inimitable Seventies retro kitsch that we all love so much. Travia: When Tombs of the Blind Dead was initially released, in some places it bore the forehead-smackingly stupid title Revenge of the Planet Ape. Obviously greedy and unsympathetic execs wanted to shamelessly cash in on the recent success of Planet of the Apes (1968). The mind still boggles though. James: This one sounds like a winner. I'm going to have to give it a try. I have recently become a Fulci devotee, and this sounds much in the same tradition. You said the magic words with "good old fashioned schlocky horror fest with genuine moments of tension and jaw-droppingly astounding visuals." That's it, baby! Sold! Excellent post. Ive yet to see the last two entries in the series, but Tombs of the Blind Dead has quickly become one of my all time favorite Spanish horror flicks (Cant top Naschy's wolf man though!). Excellent review for a top notch movie.